Luxury, family owned 5 bedroom villa near to the sea. A luxury family villa with 5 bedrooms sleeping up to 10 in great comfort. A/C for the summer, central heating for the winter. 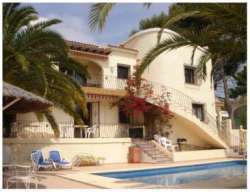 A lovely spacious and versatile villa perfect for families and groups of friends. 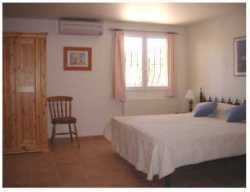 Situated in a quiet cul de sac, just 10 minutes walk from the sea. With very comfortable accommodation.each level has it's own living room and kitchen and the bedrooms and bathrooms and well designed and furnished. There is a beautiful, spacious terrace surrounding the blue, mosaic lined pool.Ample shade from the many palm trees. Large, private plot including citrus orchard.private secure parking. Easy reach of all amenities including restaurants, beaches and coves, there is an excellent supermarket within walking distance and the bustling fishing port of Moraira is just 5 minutes drive away by car or coastal bus. The impressive mountains and the Jalon Valley act as a backdrop for this lovely coastal area of Spain. Good golf, great hiking/walking, marvellous restaurants and simple pleasures. Book now for reduced prices until the end of May 09. Prices above represent about a 15% reduction for that period. Smaller group? 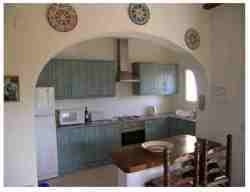 up to 4 people can rent the main level of the villa for a reduced price when available. Please ask for details and pricings.